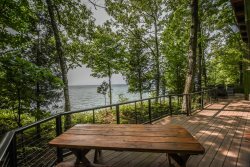 Arcadia Vacation Home on Lake Michigan! This cute second-floor apartment is less than 500' from the Lake Michigan public beach. Recently redecorated and cute as can be, perfect for couples or small families. Walk to downtown or walk to the beach. You'll only need to use your car to see the Point Betsie Lighthouse or take in the Sleeping Bear Dunes. Bring some friends and rent the main floor apartment to accommodate larger groups. Walk up into this second floor unit and enjoy the comforts of home. To the right of the stairs you will find the bedrooms. Both are tastefully decorated and offer a place to unwind at the end of the day. Straight ahead you will find the bathroom which gives you antique and modern touches blended together beautifully. The living room is to your left. Enjoy quality time with your family in this comfortable space that offers views of the some of the historical homes in the area. Directly behind the living room is the kitchen and dining area. You will find access to the deck off the kitchen. All rates and amenities are subject to change until rental agreements are approved by management. Please see our terms and conditions, FAQ and contact a reservation agent for more details.